On June 15th, 2012, Disney California Adventure completed it’s 5-year billion dollar expansion, and officially re-opened. The re-branded park is wonderful (expect for Hollywood Land. They need some help)! Cars Land is a marvel to look at. It’s incredible detail is unrivaled. Radiator Springs Racers is not only huge , but it contains what may be some of the best animatronics I’ve seen. The ride technology- allowing the cars to split off and experience two separate scenes, and then race side by side- is awesome. Buena Vista Street makes the Sunshine Plaza that was there before look even worse. The Street is filled with so much life and homages to Walt. My favourite thing may be the Red Car Trolleys. It’s such a simple little attraction that doesn’t do anything more than add a layer of realism. I love how they look. I’m a sucker for anything 1920’s and trains/streetcars, so this street is an instant winner for me. Today, I’m sharing my Buena Vista Street inspired graphics. These poster-like images will fit your iPhone’s screen. That’s all for this week. I hope you enjoy my work (and spread them around, too. I’m looking into graphic design as a career, and need exposure!). You can follow me on Twitter and on Facebook. Thanks for reading! A Look at Some Pretty Big Going-Ons, Refurbs, and Openings in the Parks This Year! It’s happening. Not that we didn’t already know that. Nevertheless, this revamp is much needed, and appreciated. It’ll be very interesting to see what’s done to the attraction and (perhaps even more interesting) the queue. Chances are that all this refurb will consist of is queue work. That’s nice, since the queue of endless switchbacks can be pretty unbearable. Rumour has it that we’ll see some interactive elements added. Also, I’m sure that the 3rd lift hill scenery will be addressed, as they should look at it after the Paris accident. Work began last summer. Skyway building is down, and walls have gone up. The Pet Cemetery is gone, and the Merchandise Cart moved. The restrooms between Harbour House and the end of Peter Pan’s queue will be removed to add more Pan queue space. And not just any queue space, Interactive Queue Space. Work has already started on Pan’s queue, which will not close for the major additions. Dumbo is closed, and elephants removed. On the other side of the park, the new spinner is in place and spinning. There’s still quite some work to be done, like cement work, the tents, finishing Goofini, finishing Dumbo’s queue, and all of Casey Jr.’s Roundhouse….So really, everything. They’re racing the clock here. Will they get it done in time? Probably not. I expect at least one Dumbo to be open in time. Everything else will probably open in phases. Maybe the most exciting part of the FLE, aside from the Mine Train Coaster. Mermaid will be a nice little darkride (as we saw with DCA’s version), and B&tB will be a nice, atmospheric addition. As much as I love B&tB (saw it in 3D today as of writing! ), this area of the expansion is kinda….unneeded. Be Our Guest will be a restaurant, built right next to another restaurant, Gaston’s Tavern, both of which are built right next door to an existing restaurant, Village Haus. Even though the Haus can get pretty crowded, I don’t think they needed to put the eatery right there. Another hotel. I’ve really nothing to say on it. It’ll be okay. Lil’ different from the other value resorts, seeing as the doors don’t face outside. Other than that, it’s nothing special. This is a big one: nearly a whole block of Main Street is closed down for a restaurant expansion. This project started with the fantastic-looking Jolly Holiday Bakery, and will end with new seating for Carnation Cafe. Other things going on include the new music loop. The new music loop, though small compared to what else is going on, is pretty significant. It’s completely re-recorded (No more Paragon Ragtime Orchestra), and sounds fantastic. Overall, Main Street is getting quite a bit of love. Biggest news here is the new cars. Those old tandem seat cars are a thing of the past now, replaced with a sleek WDW-Space Mountain-like 3 seater. Seeing as I’ve never been to Disneyland to ride the Matterhorn, and have only heard of the uncomfortable the tandem seats cause, I can’t say much on the topic. Pretty exciting. A whole new kind of Main Street for this troubled park. After seeing things like the Pump House, and Carthay Circle, and concept artwork, I’m sure it’ll be a nice land. With all the Disney references, I’m sure Disney fans will have a blast looking for them. Personally, I love the 1920s. The Red Cars will be a fantastic piece of theming for the land. All in all, it’s a home run of a land to me. Easily the biggest bit of the DCA expansion, Cars Land has been under our constant surveillance. Though I, like many others, don’t particularly care for the whole land being themed to the Cars franchise, the land will still be fantastic. The amount of neon going into that land will be stunning to see at night! Then there’s Radiator Springs Racers. The perfect E-Ticket that combines dark ride and thrill. The sheer size of the rockwork is impressive enough to want to ride it. Then you remember the ride has 2 competing tracks! Awesome. After seeing first-hand how wonderful Disney Cruises and the Disney Dream are, I’m excited to see this new ship. It’ll be fantastic to sail in. Hope I get a chance to sail aboard her. So while some of those things may seem unimpressive, that’s just all they’ve planned for 2012! Quite the year, thus far! It’ll be exciting to see everything opening up. Alright, let’s start with me saying: No, this article will not become some huge Star Wars nerd canon-questioning article. Anyone can follow on it (though I may throw in some Star Wars jargon). Star Tours: The Adventures Continue has a very interesting storyline. Last time I was there, I really listened to everything going on. By flight 3 of that evening, I had cooked up that there is a larger story at play. Is it just bad luck that 3PO was the captain AND we were perused by the Empire? Or perhaps that was the plan?…. 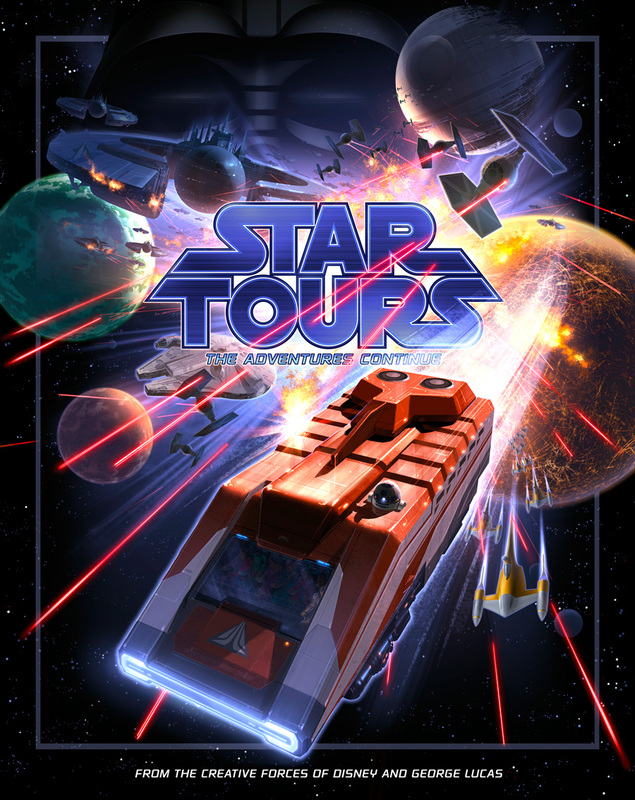 In Star Tours: The Adventures Continue, announcements are heard overhead in the queue, warning that there may be Rebel spies in the area. Remember at this time, the Rebel Alliance was new, and the Empire was ruled by The Sith. including one of the Alliance’s founders (and close friend of Antilles, and 3PO and R2’s owner). Perhaps R2-D2 and C-3PO are part of the Rebel Alliance? Well, R2, at least. 3PO never seems to know what’s happening. After all, he had his memory wiped of everything that happened before serving under the Organa family. Perhaps R2 knows more, and because he cannot ‘talk’ he is more likely to stay quiet (plus, R2 is loyal). Prior to boarding the Starspeeder, the Binary Motivator begins to act up, causing C-3PO to come and fix it. Once the proper captain AC-38 (Ace) has departed the ship (which is set to depart in a few minutes), he is called over by someone off-screen. At this point, the door shuts behind 3PO, locking him in. Unknown to him, it’s time to depart. Ace had not returned. Once the flight takes off, 3PO proclaims that he cannot fly the ship, he shouldn’t fly the ship, and for R2 to stop the ship. This doesn’t work, and the speeder continues flying. Suddenly, the Empire stops the ship, and finds that a Rebel spy had been placed in it! Though ordered to hand them over, 3PO attempts to fly away, and R2 even pulls out the ship’s laser cannons as defense. Eventually, it is discovered that the spy was planted in the ship by a Rebel and is to be transported to a safe location to deliver important information that could bring an end to the Empire. R2 jumps the ship to lightspeed (3PO has basically lost control of the ship). The spy is delivered, and the Rebels are happy. 3PO was put in the ship on purpose. Ace was lured away from the ship, and was prevented from returning to it. R2 knew the whole time. All of the Rebels knew that this was the flight to protect. Ace would have been the responsible captain and allowed the Empire to capture the spy. By putting 3PO in the ship, Star Tours could not be found guilty of aiding the Rebels because 3PO was not the proper captain. Had Ace attempted to evade the Empire, Star Tours would have gotten in trouble for allowing their pilot droid to disobey the Empire. 3PO had no idea how to fly the ship. With R2 the reliable droid in charge, there would be no worries. Having R2 serve as the navigator droid furthers beliefs that this was planned. Any other astromech droid may not have responded the same way R2 had. Pretty self-explanatory. He was a responsible pilot droid, and would have made it back in time. He wouldn’t have just left his ship in the hands of 3PO, either. In the queue, R2 is repairing the ship. Who’s to say he didn’t ‘accidentally’ cause some malfunction of the Binary Motivator? R2 refuses to land the ship when he knows good and well that 3PO is inside, and pretty much takes control of it. R2 brings out the guns when confronted by the Empire.This act of retaliation shows that R2 is fighting to keep this Rebel alive and safe. R2 jumps to hyperspace without permission, multiple times. Who knows where this Starspeeder was headed, anyway? Who says it would be going to wherever the spy needed to be? This one was R2’s, so it shouldn’t matter. Cordinates were to be sent to R2 regardless. Why would a Gungan just say “Hey, yousa need to go here for the spy!” before we even identify ourselves? Didn’t those Vulture Droids just ask us to identify ourselves 10 seconds ago? Obviously this was planned, and all the Rebels in the area of wherever the spy was set to land were informed of the flight number (which was probably set a long time ago, as the Navigation Droid’s ID is on each Starspeeder). How would the Rebel who sends a transmission know where we were, and who we were? They obviously didn’t just send out a message to all Star Tours flights. They had to know it was this one. I’ll even go as far as to say that the poor Mouse Droid that plummets to his death during the pre-show was in on it. Perhaps he was part of the Rebel Alliance, and carried the message of the plan to one of the other crew members. His falling would call for re-programming on his navigation circuits, or even crush him. That would lead to memory wipping, leaving no trace of a Rebel message. Though not a conspiracy, I’d like to submit one more of my inferences. There are multiple Starspeeder 1000s. Each has a different paint scheme, a different flight branding (Dantooine Transit, Bespin Direct, Air Alderaan, etc.). Whether or not these are Star Tours’ ships is still up for debate, but I believe that these may be related to the Endor Express of later years. Star Tours obviously visits many locations throughout the galaxy, so why just focus on Endor? Even the fact that it was referred to as “The Endor Express” and not “Star Tours” would further this assumption. ‘Course, I could be wrong, and those ships belong to other companies. Then again, why would they belong to other companies and be parked in a Star Tours terminal? There are Star Tours ads everywhere, and none for these other brands. Hrm. But yep, that’s what I’ve got to say this week. May the Force be with you! I know that I promised a D23 Expo recap entry. But, school prevented me from seriously writing this week. Sorry. So, I’m typing this breif opinion article up on Saturday morning. NOTHING.….wait, there was one thing. A new Princesess experience replacing the famous Plaza Gardens at Disneyland. Right…I don’t have a problem with this, per say. It looks to be somehting very cool. They were lacking an experience like this at Disneyland. BUT, I do not in any way approve of the spot, other than the great backdrop. The Gardens are famous. Famous. They’ve been there since Walt’s time. Ever heard that Elliot Brother’s at Disneyland? “Let’s dance at Disneyland!” (great song. Love how it’s really a commercial put into song). That is famous. Maybe it’s because I like swing music, but ripping that out just seems like ripping out an important part of the park. If Ii understand right, there is a whole stage that is currently used for nothing more than Princess MnGs near Small Wold. So why not bulldoze it? They don’t even use the stage. It just seems like that would be the better spot. Next, I’d really like to address that people complained that “Walt Disney World got the shaft again!” How on earth can you claim that?! If I recall correctly, Walt Disney World was the center of attention last Expo. Both of the big announcements (Star Tours II, FLE) were for it. Yet, none of the Disneylanders had an qualms. So this year, when WDW gets no news, why should all of the WDWers complain? If anything, the foreign parks, especially Paris, should be complaining. People need to stop and think: Disney is spending how much money on how much expansion? And how much expansion is going on at WDW right now? Fantasyland, and Downtown Disney work, new hotels, and whatever minor things we’ve gotten. That’s quite a bit. And how much does that cost? Quite a sum. So just because Epcot gets nothing does not mean we’re forgotten. It means they may not have the money yet. Now, do Epcot and DAK need somehting? Absolutely positively. Especially DAK. But right now, DAK’s attendance is fine. Disney is going to focus on it’s flagship park, the Magic Kingdom. That is where most families go. That is where people go. It’s a Mecca to all the world. So for them to be doing an expansion in that park is a no-brainer. It’s the biggest park. Now why does it have to be princesses, a very gender/age/target audience centric, theme? Because Disney isn’t catering to the fans. They are catering to their biggest source of revenue. Go into Magic Kingdom, and you will see that Fantasyland is the most crowded, popular land. Full of little children who want to see princesses. Give the people what they want. So yup. That’s my input. Don’t forget to subscribe. Or, follow me on twitter at Twitter.com/Imagineer2017. As well, make sure to listen to the D-History Podcast. This week’s show is really good, a topic I know plenty of people enjoy. The Disney Channel and it’s history. Well. Time flies. Bye bye. So now, guests staying at any of the resort line resorts now have to walk or boat back home after a long day. Wow. These resorts, the Contemporary (and the adjacent Bay Lake Tower), Polynesian, and Grand Floridian, just so happen to be the most expensive resorts on property. So why do they get the shaft? These guests are paying the most, yet getting the worst treatment. That seems far from fair. Already, I’ve read at least 10 comments stating to Disney that they will be canceling their trip because the monorail won’t service their resort. Disney, you’re losing business by doing this. As well, the Epcot line now shuts down early. So what happens if I parked at the TTC and parkhopped over to Epcot? Uh-oh. Or what if I’m staying at the resort line resorts? No EMH for me, I guess. This change has yet to be explained. Some have claimed that it’s an attempt to eliminate Extra Magic Hours all together. This makes little sense, as it can be a very important factor in some people’s vacation planning. Others have said that this change was provoked by the Monorail operators asking for additional downtime for monorail maintenance. This is a baloney reason, as all 11 monorails cannot fit in shop to be service all at once. So running 2 or 3 monorails really wouldn’t hurt. Just alternate which ones come in each night, that way, they’re all serviced and we still have trains. 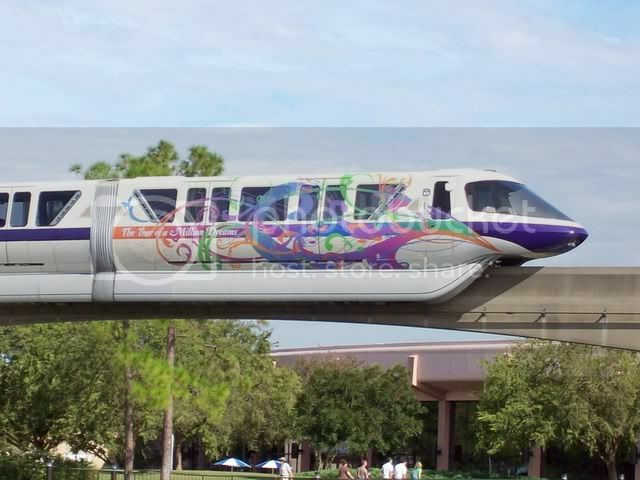 Well…In other news, Monorail Coral has returned and the Tronorail has been derezzed. As much as I love TRON and the Tronorail, I’m happy to see it go. It has been here for long enough. The film came out 6 months ago. But it was cool, to say the least. WDW had never gotten anything like that before. The closest we’ve gotten were the so-called ‘Pixie Vomit’ stickers that were put on during the Happiest Celebration on Earth. Disneyland has gotten full monorail wraps many times: for the subsand for the HCOE for example. But there, it’s a little different. Those monorails are passing over public property, so they are effective billboards. In WDW, the ‘rail travel on Disney property. They don’t need to advertise. The first time we had heard they were coming, no one seemed happy. Giant moving billboards running through Epcot. It wasn’t the nicest idea. Some people didn’t even think it fit Epcot. But once they it was up and running, no one seemed to care. It was just cool and fun. I’ll miss it, but it really wasn’t anything special. It was very popular though. Popular enough that they’re releasing a toy version of it at this year’s D23 Expo. So, if you’re a fan, I’d pick one up. That’s this week’s post. Hope you enjoyed. I’m going to go play with my monorails now. Remember to follow me on Twitter and Facebook, and also to rate, comment, and subscribe to my blog. You’ll be hearing from me soon. Until then, so long! Some would disagree with this statement, some would agree. Some folks believe that this overhaul is no more than a massive refurbishment of the classic Star Tours attraction. Others claim this to be a whole new attraction, ready to bring more people into the Studios. In this post, I’ll argue the side that it’s a new attraction, and then respond with why it can’t be considered ‘new’. Argument: Its a new motion profile. That’s the equivalent of a new roller coaster track. Counter-Argument: Its still just a simulator. Its nothing new. Argument: Its now in 3D! Counter-Argument: But it’s still just a film. Argument: New footage, therefore it is new. Counter-Argument: So if we replace scenes in, say, Philharmagic, it would be brand new? No. Argument: It’s a brand new story! Counter-Argument: No, it’s still the story of an intergalactic travel agency. As well, when Space Mountain came back from its refurb in ’09, it was given a story. So even arguing that a new story means a new attraction is invalid. Counter-Argument: Yea, by design. By changing time, some of those things are mandatory. Regardless, its more of a replacing of characters. Argument: I think it’s safe to assume the Droid Room is gone. There will be a whole new queue show scene. Pretty significant back story could happen in there. Counter-Argument: Again, Space Mountain had queue changes, too. Changed up it’s story quite a bit. I think the problem with this situation is that we’ve never had anything like this before. The closest we’ve come is with Tower of Terror’s various incarnation. Those weren’t changing anything other than the drop profiles, but were marketed as a new thing. Not a new ride though. Never before have we had a simulator go down to become a brand new show. Typically, when things become out-dated, they are closed, and replaced with a brand new attraction. With Star Tours, that isn’t possible. Star Wars, arguably the most popular franchise on the planet, is still a relative film/TV series that people know and love. Star Tours, though outdated, was one of the most popular attractions in the Walt Disney World and Disneyland Resorts, strictly for it’s Star Wars tie-in. A new Star Wars attraction was necessary. So why not keep the popular simulator attraction, eh? Overall, I’m on the fence. I don’t consider this to be a whole new attraction, but it is far from just a glorified refurbishment. The new attraction will bring a lot of people into the Studios, and it will be a new experience. But it isn’t new. It follows the story of Star Tours the company just as the previous had, but it does contain a new film, new show elements, and new on-ride story. It’s unlike anything we’ve seen before, making it hard to classify as new or refurb. So, that be this week. I’m excited for Star Tours to open! It’ll be great to see it in person. From what I’m hearing, its incredible. 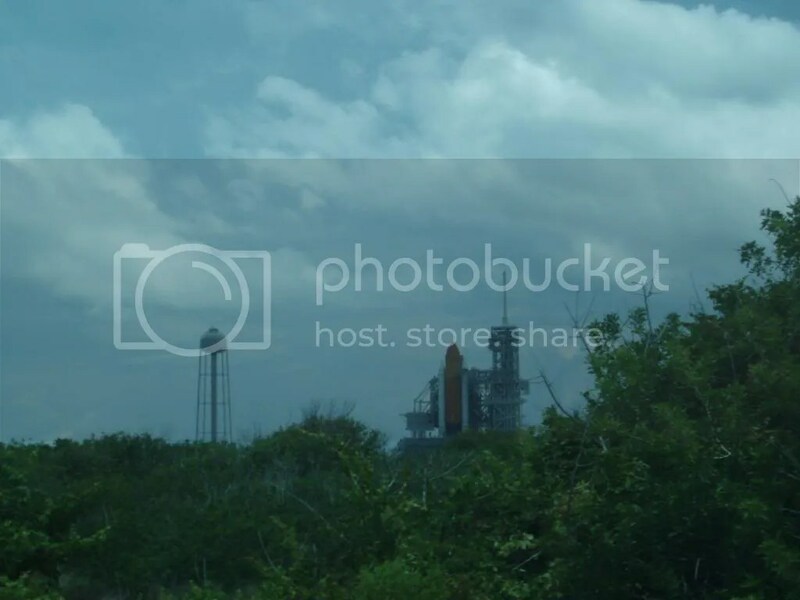 Don’t forget to share my blog with others! Not only does it make more readers, but it makes me want to keep writing! UPDATE: The attraction has begun soft openings. I will be there tomorrow to see it for myself. I will try posting pictures and comments ASAP throughout the day.